Reviews | 50 Amp Generator Buying Guide | Why Buy A 50A Generator? You are here: Home / 50 Amp Generator / Reviews | 50 Amp Generator Buying Guide | Why Buy A 50A Generator? If you’re looking for a 50 Amp Generator, you’ve come to the right place. We put together this comprehensive Buying Guide, filled with our recommendations with accompanying reviews. As well as a lot of practical advice and information to help you make a smart buying decision. We hope you find this guide useful. Our goal is to help you choose the best 50 Amp generator for your needs (and budget). Watts or wattage is what you have in mind when considering a generator. Normally, the name or number of the generator includes the starting Watts. Basically, the capabilities of the generator are given in Watts. So we compare and select them based on those parameters. Unfortunately, it’s not always immediately clear if a particular generator can really deliver 50 Amps. Because of that, we’ve decided to compare some of the available generators that can connect to 50 Amp receptacles. We aimed to determine which generators can actually deliver 50 Amp, both in starting and running amps. It’s an interesting way to compare the generators, and it reveals some discrepancies. We selected generators that have a 50 Amp outlet and should, at least be able to give a starting current of 50 Amp. Then we analyzed the figures to determine if they actually deliver 50 Amp. To my mind, a generator with a 50 Amp outlet that cannot actually deliver 50 Amps is not a true 50 Amp generator. Or is it? We selected six popular 50 Amp generators, and I discovered that three can deliver a starting current of 50 Amp. One of them can deliver more than 50 Amps starting current, and it will deliver close to 50 Amp running current. I made another discovery, all of these 50A generators have an over-current protector of less than 50 Amp that will prevent 50 Amps from being delivered. What this means is that we can connect them to a 120/240 Volt AC, 50 Amp Receptacle (NEMA L14-50R). But, the circuit breaker will trip before the supply reaches the 50A capacity of the receptacle. So, you’re not able to utilize the full capacity of the generator. We will consider the advantages of a 50 Amp generator and their application. In doing so, we will also decide why 30 Amps is sometimes not enough. These big 50 Amp generators are powerful enough to use as backup power for the house. They are also ideal as a power source for the RV. Being portable, these generators are also useful for tailgating, working on the ranch or construction site and many other emergency power needs. Before we review the generators, we should understand what the 50 Amp limit is and how it relates to Watts. The most important consideration when using a generator to power an RV is the way you will connect it to the RV. The preferred connection is made using a power cord. It will be a 30 Amp connection or a 50 Amp connection. Therefore, we need to ensure the generator is compatible. Usually, the smaller RV’s with one air conditioner are fitted with a 30 Amp connection. The larger ones with two air conditioners and more electrical appliances are equipped with a 50 Amp connector. You need a generator with a 30 Amp outlet for a 30 Amp RV. Likewise, for a 50 Amp RV, you need a 50 Amp receptacle. At 120 Volts, you are limited to a 50 Amp maximum current, which amounts to an output of 6,000 Watts (120 x 50 = 6,000). At 30 Amps, you have a 3,600 Watt limit. These calculations are based on a purely resistive load like a surface heater. At 240 Volt the 50 Amp current limit allows 12,000 Watt. To understand how the generators deliver 120 and 240 Volts we will look at the wiring of 30-Amp and 50-Amp power cords. Four types are normally used. 120 Volt twist lock (L5-30R). If you open a 120 Volt 30 Amp power cord, you will find it has three prongs. The three prongs correspond to a hot 120-Volt wire, a neutral wire, and a ground wire. The 50-Amp power cord has 4 prongs corresponding to two 120-Volt hot wires, a neutral wire, and a ground wire. It means the 50 Amp connector has two 120 Volt lines capable of 6,000 Watts each or 12,000 Watts in total. 240 Volt generators use an alternator with two main windings that generate the power. Each winding gives 120 Volt and the total current is limited by a clever circuit breaker. The circuit breaker monitors the current drawn from the generator windings so it can isolate the generator should the load exceed its rated current. It is designed to allow a starting current for a limited time, normally 2 to 3 seconds. The starting current is only limited by the abilities of the alternator. Additional supporting windings are used as well, but we will ignore them for now. The two main circuits are wired to the two hot wire legs of the four-prong 30 and 50 Amp connectors. The 120 Volt connectors are balanced out between the two lines. In our article, Best RV Air Conditioner, it became clear that all the RV rooftop air conditioners use 13 to 15 amps. As a result, almost all 50 Amp RVs are wired so that the two 50-Amp, 120-Volt lines are used separately. One air conditioner and some appliances are wired to one hot leg, the second air conditioner and the remaining appliances to the remaining hot wire. With an ideal 50 Amp generator, each winding can deliver more than 6,000 Watts and, when combined, they deliver more than 12,000 Watts. Both will be protected by 50 Amp over current switches to limit the maximum current to safe levels. This main circuit breaker may be a double pole or two separate protectors. In the review, you’ll see that all our 50 Amp generators with 50 Amp outlets are limited by lower than 50 Amp circuit breakers. It means none can actually deliver 50 Amps to an RV. I’ll list the output abilities and over-current protection values of the generators, to clarify the comparison. Starting Watts : 12,000W / Running Watts : 9,500W (40 Amp running). 50 Amp generator. Cannot ship to California : non-CARB approved. (2) 120V 20 Amp Standard Receptacles. (1) 120v/240v 50 Amp Heavy Duty Outlet. Running current 9,500 Watts or 40 Amp at 240 Volt. The value of the current limiter is not given. I guess it would be limited to 40 Amp. If the two main windings that generate the power are limited by a 40 Amp circuit breaker as I predict, each can deliver 4,800 Watts and combined they deliver 9,000 Watts running current. In 120/240 Volt mode, the two circuits are wired to the two legs of the 50 Amp connector and all the other connectors. When delivering its power to a 50 Amp RV, it will have the ability to give you 9,000 Watts running current. While it may deliver up to 12,000 Watt starting current, 40 Amps running current per leg are all this generator can deliver. When using it with propane, the starting current is 42.5 Amps, but it will still power two air conditioners and the most important appliances. Using propane, you will quickly learn which appliances will work together. But even on propane, it is a good power source for a big 50 Amp RV. The DuroMax generator has an interesting feature that selects one of two output voltage settings. In the manual, it is referred to as Power Boost Technology. If you select “120V ONLY” it will only power the 120 Volt outlets and one leg of the 240 Volt connectors. If only 120 Volt appliances are connected to the generator, you select the “120V ONLY” position. It doubles the 120 Volt amperage and automatically balances the load. In this position, you then have two windings combined into one going through the same breakers. The same limits apply. I think the only advantage is that the load on the alternator is balanced. If a 240 Volt appliance is connected to the 4-prong receptacle, the switch must be in the “120/240V” position. When using this 50 Amp generator as a backup unit for the home, the limit of what it can deliver is still the same. It’s because of the current limiter on the generator. To use the full 40 Amps, you will have to use the 50 Amp connector and the appropriate cord to connect it to the house receptacle. If your house is not wired with a manual transfer switch, please install one, it’s safer and more convenient. If you still need to buy one and need some help in choosing one, we can help. You will find lots of information in our article : How to Connect a Portable Generator to a House with a Transfer Switch. 50 Amp generators are heavy, this one weighs 269 pounds, so I tend to refer to them as ‘luggable‘, rather than portable generators. To aid in moving it around, the generator is mounted in a strong open frame that supports the engine and generator components. It’s also fitted with two 10 inch wheels that are mounted on the balance point to make moving it around convenient and easy. It has two fold-down handles for lifting the other end when moving it. A battery is supplied with the generator which must be installed first before it can be used. The battery will not drain during storage because it is protected by a battery switch. In the off position, it ensures that the battery is not connected to any circuits so that it will not lose power. On the output side of the generator, you will find the three round output receptacles which provide all the convenience you need. (1) 120 Volt 3-Prong Twist Lock (L5-30). (1) 4-prong 120/240 Volt AC / 50 Amp Receptacle (NEMA L14-50R). (2) normal house style outlets are available as a GFCI protected 120 Volt AC / 20 Amp Duplex (GFCI 5-20R) assembly. All the outlets are protected by over-current circuit breakers. In addition to the AC connections, a 12 Volt DC connection is provided that can provide 8.3 Amps. DC+ and DC- mounting posts are used. A set of DC charge cables is supplied with the generator to charge 12 Volt automotive style batteries or small DC appliances. I’m a bit disappointed to see that the outlets are not protected by rubber covers. It keeps them clean and protects small children who may be tempted to insert things. All the outlets are conveniently grouped together on a user interface panel with the circuit breakers and all the controls for the generator clearly marked. A key switch is used to switch the generator on or off, and to start it. An idle control switch is used to switch on the fuel-saving feature that lowers engine speed when the generator has no load. There’s a ground terminal on the interface panel that has neutral bonded to the frame of the generator. It is used to ground the generator to an earth spike. A Volt Meter provides a reading of the voltage output of the generator. A fuel gauge is fitted to the gasoline tank. It’s a handy addition that makes it possible to estimate the runtime that is available. It’s necessary because a generator that uses gasoline has to be stopped and allowed to cool a bit before refueling it. This gives you enough time to plan the re-fuel shutdown. The shutdown should not be a huge inconvenience because the generator has a run-time of ten hours at 50% load on full tank of gas. For generators, kilowatt-hours per gallon can be interpreted in the same way as you would miles per gallon with a car. The fuel efficiency of the DuroMax XP12000EH generator with 9,500 Watt running power using gas is 6.01 Kilowatt-hours per gallon. Together with the Firman, this one’s gas fuel consumption tops the rest by a small margin. The fuel efficiency of the Champion is worst at 4.92 Kilowatt-hours per gallon. A convenient connection at the rear of the generator is used to connect the generator to propane (DuroMax XP12000EH). It will run on propane for 20 Hours at 50% load using a standard BBQ tank size. It sounds like it could be an exaggerated claim but it is still very convenient to use propane. The engine runs cleaner and starts immediately on propane. Keep in mind that a propane tank is not included in the deal with the dual fuel generator. Customer feedback is very good, with a lot of positive response regarding propane consumption during lengthy power outages of 4 days and longer. Starting Watts : 9,375 / Running Watts : 7,500 (30 Amp running). Gas-Powered 50 Amp portable generator. Remote key fob allows you to start & stop it up to 80 feet away. Cold Start Technology ensures a quick start in cold weather. Covered Outlets : 120/240V 50A (14-50R) and 120V 30A (TT-30R) RV outlets as well as a 120/240V 30A locking outlet (L14-30R) and four 120V 20A GFCI protected household outlets (5-20R). Volt Guard built-in surge protector prevents overloads. Keeps generator safe from spikes in voltage. EPA certified and CARB compliant. The Champion 100161 7,500-Watt generator runs on gas only, and it has a remote start feature. The generator is supplied with a remote key fob which allows you to start and stop your generator from up to 80 feet away. It’s a very convenient feature, should you prefer not to run the generator continuously. The 439cc Champion engine with electric start is supplied with a battery which must be installed first. Starting current is 9,375 Watts or 39 Amps. Running current is 7,500 Watts or 31.3 Amps. But, it is protected by two 30 Amp overcurrent trip switches as depicted in the circuit diagram. The two main windings are each limited by a 30 Amp circuit breaker. Each can deliver 3,600 Watts running current and combined they deliver 7,200 Watts. Therefore, when powering a 50 Amp RV, it will have the ability to give you 7,200 Watts or 30 Amps per leg running current. When powering appliances in the home, keep in mind that the air conditioner is the most power hungry unit. If you cannot use the most essential appliances with the air conditioner, you may have to do without the air conditioner for a while. Three 12 Watt lamps, 1 refrigerator, a 625 Watt microwave, a blender and a toaster already consume a total of 4,800 watts. That’s equal to 20 Amps. Add to that, the air conditioner using 14 Amps and the total demand is 34 Amps. So to be compatible with the 30 Amp limit per circuit, you will have to limit the appliances. When used as a backup unit for the home the same problem will occur. It will be great for lighting and some small appliances. But you will have to be careful how you select appliances like a sump pump or furnace fan blower. They demand more power during start-up and also consume more running current. You will find lots of wattage guides on the internet that will let you select appliances to find the total load. This generator is the smallest of them all, but it still weighs 207 pounds net. It has two 10” wheels that make moving it around a lot easier. The comfortable fold-down handle is sturdy and provides a good grip. The battery that’s used to start the engine provides 12 Volts DC to the electric starter and remote control receiver module. A battery switch is placed on the panel that you use to enable or disable the electric start. When disabled, the battery is disconnected from the circuits so that it will not be run down. AC receptacles are neatly grouped on the interface panel and clearly marked. It caters to all the necessary outlets. 120/240V 30A (L14-30R) — both protected by the push to reset breakers. (2) Duplex GFCI 120 Volt 20A (5-20R) — Same outlets as your home. Note : All the outlets are neatly covered with flip-up rubber covers that will keep out the dirt, and it makes the connectors safer. A DC outlet is not provided on the user interface panel. A ground terminal that is connected to the frame and the neutral of the generator is to be used for grounding the generator. It has an “Intelligauge” three-mode digital meter that displays the running hours, output voltage and frequency as you select them. The supplied 12 Volt 15AH battery is recharged while the engine is running. But, I would recommend that you fully charge the battery at least once a month. It will keep the battery healthy and, at the same time, ensure that the remote/electric start works at all times. The generator does not have a fuel level indicator so the motor will run out of fuel without prior knowledge. It may tempt you to open the cap while the generator is running to peek inside, but NEVER do that, it’s dangerous. Fuel will spill from the tank due to the vibrations of the running motor and may cause a fire or explosion. The manufacturer states that the run-time is 8 hours on a full tank of 6.1 gallons with a 50% load. I calculated the consumption using the 7,200 Watt running power at 50%, and it gives you 4.92 kilowatt-hours per gallon. This is our least-efficient engine, which is surprising when you compare it to the Firman with the same size engine (439cc). The Firman delivers 6 kilowatt-hours per gallon. The Champion engine uses an automatic choke, a necessary addition because of the remote start feature. A choke lever is provided for those times when the battery fails, and a recoil start is needed. This engine is also equipped with a low oil shut-down detector. It stops the engine so it will not fail because of low or out of oil conditions. The noise levels of this generator are given as 74 dBA from 23 feet. It’s normal for an open frame generator, louder than a vacuum cleaner and better than a lawnmower. Some homeowners using it during outages find that the machine is too loud, and this is true for all open frame portable generators. This machine is EPA and CARB compliant, and the exhaust is fitted with a spark arrestor. It is therefore approved for use in national parks. An Automatic Voltage Regulator (AVR) maintains the generator output voltage to the required level. It’s a great advantage because the voltage will not fluctuate under varying loads, you will simply hear the engine working harder. Feedback from customers is generally good although some complaints about the noise levels did arise. Enough power to keep your entire home running. Can power the following all at the same time : lights, TV, refrigerator, pump, air conditioner, and fan. Also, powerful enough to run 4 to 5 power tools. Weatherproof covers provide added protection from the environment and rugged working conditions. Backup recoil start : oversized recoil and ergonomically-designed grip. Running current 9,000 Watts or 38 Amp, a dual 38 Amp circuit breaker is installed. Limited by a 38 Amp circuit breaker, each circuit can deliver 4,560 Watts and combined they deliver 9,120 Watts running current. The two circuits are wired to the two legs of the 50 Amp connector and all the other connectors. When powering a 50 Amp RV, it will have the ability to give you 9,120 Watts or 38 Amps per leg running current. The A-iPower SUA12000E does deliver 50 Amps Starting current and falls into my “true” 50 Amp generator category. It will however, not deliver 50 Amp to the RV at the 50 Amp connector. The same is true when used as a backup unit for the home. It will be limited to 38 Amps (9,000 Watts) to the transfer switch. When doing your calculations for home backup, keep this limit in mind. The weight of this A-iPower generator is 216 pounds. Handling it is done by using the factory-installed fold-down handle and two 9.5-inch solid wheels. With the help of a friend, it is easy to lift, the tubing frame comes in handy when doing this. The battery is supplied with the generator and is mounted to the frame. I feel the battery is rather exposed where it is mounted. You will have to be careful when handling the machine. Four NEMA 120 Volt AC 20 Amp GFCI-protected outlets provide added protection and safety under damp conditions. One 12 Volt DC 8.3A automotive style adapter plug for charging a battery or with a USB adapter to charge USB compatible devices. All the outlets, circuit breakers, and switches are protected by rubber covers. You will use a keyless, one-touch button to start the generator. Its GFCI-protected outlets provide added protection and safety under damp conditions. A gauge on the fuel tank indicates the fuel level so that you can plan your next shut down for a refuel. The SUA12000E generator with 9,000 Watt running power gives you 5.79 kilowatt-hours per gallon. Calculated at a constant load of 50% of running power. This is the third most efficient 50 Amp generator by a small margin. The generator is powered by an A-iPower 459cc OHV engine of 16hp. The noise level given by the manufacturer is 78dBA at 23 ft. It is louder than the other generators. The muffler is fitted with a USDA approved spark arrester, and the generator is EPA approved. The low oil cutout serves to protect the engine when the oil level is low. A light on the control panel will be lit to assist the user in finding out why the generator stopped working. Customer feedback is good with almost no complaints. Everyone enjoyed the quality feel and good finish. This is a neat generator, and all edges are curved to prevent injury. I liked that the fuel filling port is countersunk so that fuel will not spill over during filling. Up to 12 full hours of continuous operation at 50% load. ✓ View or download the MANUAL for the Pulsar Products PG10000B16. This is a dual fuel generator, and it is possible to switch from LPG to gas or vice versa while the generator is running. It does mean though, that both fuel sources must be full when you start the generator. Otherwise, you will have to stop the generator first to fill up with gas or connect a full propane bottle. The advantage is that with more than one propane tank and some gas, the runtime can be extended almost indefinitely. A propane hose is supplied with the machine so there is no need to buy one. Running current 9,000 Watts or 38 Amp, “(120VAC @ 27 AMPs)” as given on page 20 of the handbook. It seems that each circuit is limited by a 27 Amp circuit breaker. This is according to a statement in the manual on page 20 “the generator’s rated voltage, and amperage capacity (120VAC @ 27 AMPs)”. I have previous experience of finding incorrect information in the generators manuals. So I contacted the supplier for more info, but I received none. A little disappointing, to say the least. Using the 27 Amp limits, each can deliver 3,240 Watts and combined they deliver 6,480 Watts running current. When powering a 50 Amp RV, it will deliver 6,480 Watts, 27 Amps per leg running current. When connected to the home as a backup unit during a power outage you have to keep in mind that the same limits will apply. You should limit the total load of all the appliances to the output of the generator. The generator weighs 212 pounds (approximately). Two people should lift it, and you should never lift the generator using the engine or alternator lifting lugs. You can connect lifting equipment to the frame of the generator when it is well balanced and safe to do so. Moving it around is easy on paved, level ground. In the rough, you need someone to assist you. The generator is supplied with a battery which you have to install. When not in use, the manufacturer recommends that the battery cables be disconnected. This generator doesn’t have the convenience of a battery switch to disconnect the battery when not in use. The following AC receptacles give you the ability to power multiple tools or devices at once. None of the connectors or switches on the panel are protected by rubber covers. Four home style 120 Volt outlets are provided. The outlets are not GFCI 5-20R connectors, and you are therefore not protected against shocks in damp conditions. The two mounting posts for mounting standby battery charging cables to the 12 Volt DC 8.3 Amp outlet are protected by a trip switch. A three in one digital hour meter is installed for monitoring the service times of the generator. Mounted to the left of this, is the electric start switch. It is also used to stop the engine. When starting the engine, it is switched on first and then toggled to the momentary start position. On the user interface panel, you will also find the ground terminal. You should always connect the generator to the ground terminal to prevent electrical shock. A fuel gauge is mounted to the fuel tank. The fuel tank has a capacity of 6.5 gallons with run time of 8 hours when using gasoline. This gives us a fuel efficiency figure of 5.54 kilowatt-hours per gallon. The engine is a four Stroke, air cooled, single cylinder, OHV unit with a displacement of 420 cc. Its noise levels are not given in the documentation. I could not determine if the generator is EPA or CARB compliant. A low oil shutoff is provided that will cut the fuel to prevent damage to the engine if the oil level is too low. 4-in-1 Data Minder Measures Volts, Hertz, Hours and Low Oil Indicator. ✓ View or download the MANUAL or the SPEC SHEET for the Firman P08003. The FIRMAN P08003 generator looks neat and sturdy. Supplied with the generator in the box are an oil funnel, owner’s manual, spark plug wrench, and two wrenches to remove protective shipping brackets. An interesting touch is the rubber capped remote control holder on the nameplate of the generator. The remote control can be placed inside the remote holder for transporting it with the generator. Running current 8,000 Watts or 33 Amp, a 33 Amp circuit breaker is installed. Each of the two 120 Volt main windings that generate power is limited by a 33 Amp circuit breaker. This is according to a parts list in the manual. Using the 33 Amp limit, each winding can deliver 3,960 Watts and combined, they deliver 7,920 Watts running current. The same limits apply when connected to an RV. When using the Firman P08003 as a backup unit for the home, it can be successfully connected to the 50 Amp connector. Keep in mind that the real current the generator can deliver is 7,920 Watts. You’ll have to limit your essential appliance loads according to that. This 50 Amp generator is also heavy, though not the heaviest in our selection at 218 pounds. When handling it, the same rules apply as for all the previous generators. For portability, the P08003 includes a 10” wheel kit with never-flat wheels. A single folding handle with an ergonomic grip is mounted at the highest point of the frame. Six AC receptacles are grouped in a row on the interface panel, all of them covered by flip-up rubber covers. (1x) 120/240 Volt AC / 50 Amp (NEMA L14-50R). (2x) GFCI 120 Volt AC / 20 Amp Duplex (GFCI 5-20R). The rated total harmonic distortion of 25 at full load is not suitable for sensitive equipment like cell phones and Wi Fi equipment. On the user interface panel is a 4 in 1 Data-Minder that monitors running hours, voltage and frequency. This one also includes the low oil indicator light. The generator is powered by a Max Pro 439cc Firman cast iron sleeved engine. Starting it with the remote cannot be simpler, and it works from 68 feet away. Electric start from the panel is, of course, also possible. The tank design is such that fuel spills are minimized, and a fuel gauge is mounted on the tank. The capacity of the tank is eight gallons. At 50% load, the generator will run for 12 hours before a refuel is needed. This translates to 6 kilowatt-hours per gallon. Together with the DuroMax when used on gas, this one’s fuel consumption tops the rest, not by much, the champion is worst at 4.92. A battery switch connects the battery to enable the start/run switch. Do not leave the switch in the on position for extended periods, else the battery can be completely drained. Therefore, the battery switch should always be in off position when not in use. The noise level is stated as being 74 decibels. Although it is loud, Firman points out that it is well below the standards set by the National Parks Service. A spark arrestor is fitted and, it too, has been approved by the USDA Forest Service. This portable generator is a true workhorse. ✓ View or download the BROCHURE for the CAT RP12000E. This generator will happily power a 50 Amp connection up to the point where the 46 Amp circuit breaker trips due to overload. It can run all day delivering 12,000 Watts at 240 Volt. This is the most powerful generator that I review here, and an impressive machine. Running current 12,000 Watts or 50 Amp, protected by a dual 46 Amp overcurrent limiter. Each of the two 120 Volt main circuits are limited by a 46 Amp circuit breaker. With the 46 Amp limit, each winding can deliver 5,520 Watts and combined they deliver 11,040 Watts running current. The two circuits are wired to the two legs of the 50 Amp connector and all the other connectors. When delivering its power to a 50 Amp RV, it will have the ability to power 11,040 Watts, 46 Amps per leg running current. This is the only generator in our selection that can almost deliver the full 50 Amp running current. It can be used as an effective backup unit for the home. When connected with the four-prong 50 Amp receptacle it is possible to utilize its full power capabilities. Eight AC receptacles are neatly grouped on the user interface panel, and all are protected by neat rubber protectors. Two GFCI 120 Volt 20 Amp Duplex outlets give you four 120 Volt home style outlets with ground field protection for added safety. One 120/240 Volt AC, 30 Amp Twist-Lock Receptacle (NEMA L14-30R) is available to power 30 Amp supplies. Then there is the 120/240 Volt AC 50 Amp Receptacle (NEMA L14-50R) for connecting to the home receptacle or 50 Amp RV. A 12 Volt 8.3 Amp DC outlet with a rubber cover is provided for battery charging purposes. This machine is heavy, the heaviest of them all. It weighs 350 pounds and, even when moving it around on the rubber wheels, it feels heavy. To make things easier, CAT balanced the load over the wheels and fitted the generator with a sturdy fold-down handle. A removable lifting eye is fitted to the top balance point for hoisting this heavy 50 Amp generator onto a truck or trailer. The battery is protected against discharging by the on/off switch. It is also used to start the engine, and when turned off, it stops the engine. A manual choke is used for cold starting the engine. A manual fuel valve is used to shut off fuel and let the carburetor run dry for storage. This generator does have a fuel gauge on the tank, so it is possible to determine the fuel level without removing the cap. The metal tank holds 13.2 gallons of fuel and gives you a run-time, at 50% load, of 11.5 hours. Taking into consideration that it has 12,000 Watt running power, it delivers 5.32 kilowatt-hours per gallon. For a heavy machine like this, it is not bad, but it’s the second least fuel efficient 50 Amp generator in the group. An interesting feature on the user interface panel is two LED panel lights to make the controls visible at night. It makes a lot of sense to me since this is your power source, it should have lights for night time visibility. A 4 in 1 digital display can alternately display voltage, frequency, running hours and total hours. The running hours combined with the fuel gauge reading helps to determine how long the generator will run till the next re-fuel stop. The engine idle control can be switched off when a constant speed is required to handle varying loads. This machine is loud, even at a distance. The idle control does help to reduce the constant drone, and it saves fuel by lowering engine speed when there is no load. EPA and CARB models are rated as 12,000 running Watts, the CSA Model is rated as 11,000 running Watts output. The engine of this 50 Amp generator is a powerful 670cc V-Twin OHV motor with pressurized oil system. It’s the only engine in the group with pressurized oil which is more akin to a motorcycle engine. The All copper generator produces clean power (total harmonic distortion <5%) which makes it safe for use with your sensitive appliances. 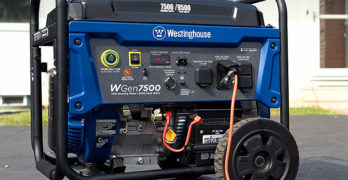 This portable generator is big by any standards, and it is also the most capable “true” 50 Amp generator in our review. It’s supplied by a trusted brand that will eagerly support its products. If you need a big one, this must be the generator of choice. It is also my personal favorite with its 11,040 Watts, 46 Amps per leg running current, although I do wish it was quieter. The total harmonic distortion of less than 5%, full set of connectors and 11.5 hours runtime make it the winner. Volts, Amps and Watts…oh my! When expressing how heat is generated or work is done we use Watts as a measure. It’s a measurement of power. It’s the rate at which electricity is being used at a specific moment. Watt-hours are a measure of energy, describing the total amount of electricity used per hour, allowing us to measure our consumption over time. One watt is equivalent to one joule (energy) per second (1 W = 1 J/s). The utility company charges for watts expressed as energy. It’s the power consumed for a time period, typically shown by your utility company in kilowatt-hours. For example: A 100-Watt light used for 10 hours consumes 1 kW-hour energy. The math is: 100 W x 10 hours = 1000 Watt-hours = 1 kW-hour. What’s the difference between running watts and starting watts? Running Watts is also referred to as rated Watts. It’s the continuous Watts needed to keep electric items running. Starting Watts indicate the additional power needed for two to three seconds when some devices start up. Normally, to start motor-driven appliances like a refrigerator or furnace fan blower. It’s limited by the maximum Wattage the generator can produce and not by its current limiter. The AVR (automatic voltage regulator) of the generator will manage the startup current. To calculate your needs, many reference sheets are available on the internet and in the generator manual. Two columns are given, stating current and running (rated) current. From the Starting current column, you select the highest startup current in your shortlist and add it to the total running current. Why buy a 50 Amp generator? It typically requires 5000 to 7000 Watts or 20.8 to 58.3 Amps to power most of your basic household items in an average-sized home. Keeping in mind that the home has a 100 or 200 Amp circuit breaker, it is a small percentage of what you normally can use. It’s only 10% to 29% of a 200 Amp home. Should we happen to buy a CAT generator that can deliver 46 Amps running current, we’ll be limited in what we can run. We can supply 46% of the current that is normally available in a 100 Amp home and only 23% in a 200 Amp home. It is clear that a true 30 Amp generator will deliver less, 30% and 15% respectively, limiting your choice even more. That’s why you should buy the most you can if you plan to use the generator as a backup power source. I always end up with a generator that I cannot afford so I have to cut back. All the devices you wish to use are not in the same area so selecting areas on the transfer box is somewhat problematic. They will not be used at the same time, so you cannot determine the maximum load by adding up the loads of everything you need. Some have a startup current to contend with, and these can be your most important appliances. If disaster strikes in winter, the total demand is at its highest. You need heat and clothes must be dried. A heat pump alone needs a 4,700 running Watt generator. It must also handle an additional starting current of 4,500 Watts, totaling at 9,200 Watts. Add to that the electric clothes dryer that can consume 5,400 Watt running current and 1,350 starting Watts. The biggest of our 50 Amp generators will not be able to handle this load. When in use, these devices startup as needed during a repetitive cycle and it’s not controllable. A portable generator used as a backup power for the home requires some compromise. I believe you should consider the generator that can deliver the most power you can afford, and it must be a 50 Amp generator for a reasonable amount of home comforts. When using it to power an RV, you are already limited to either 30 Amps or 50 Amps. You will be able to run most, if not all of the electric appliances in the RV. If you own a 50 Amp RV, it obviously makes sense to buy a generator that is as close to 50 Amps as possible.